While operators look to increasingly focus on the most economic areas in the Ohio Utica Shale, and cutting capital investment projections, activity is still strong historically. Depressed Oil and Gas spot prices lead to increasingly tight economics, or worse, for some wells, though activity is still high in relative terms. The two graphs below, snapshots six months apart, show permitted wells remaining healthy and drilling up. 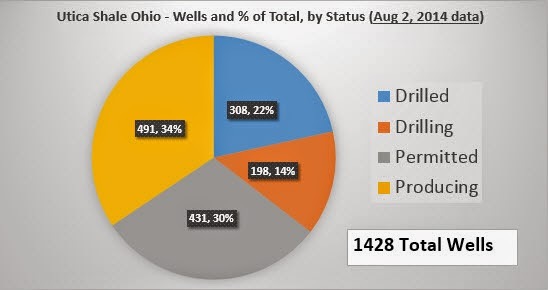 Wells classified as "drilling" and "drilled" indicate that "producing" wells should about double from August 2014 to August 2015. 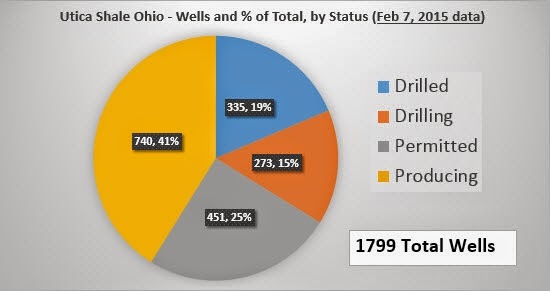 And with 72 new permits issued from Jan 1, 2015 through Feb 7, 2015, in 10 different Ohio counties, there is ample evidence pointing to relatively high activity to continue.